WHMIS Training Compliant and Up-to-Date for 2019. Includes WHMIS 2015 with GHS. Need a highly-accepted WHMIS Certificate? Sign up and get your Certificate in about 60 Minutes with our easy-to-use and fully compliant Online WHMIS Certification Training. Enjoy the peace of mind that comes with ZERO risk. We want you to be completely satisfied, and we’re very confident that you will be! If for some reason you’re not satisfied, a full refund will be offered for up to 30 days after your purchase or until you complete your course and are issued a certificate. Enjoy the peace of mind that comes with our certificate acceptance guarantee. If for some reason our WHMIS certificate is not accepted by your employer, we’ll refund you the entire cost of the course within 30 days of completion. Federal and provincial legislation communicate the guidelines relating to WHMIS training requirements. One of the most recent changes to the legislation occurred in February 2015 when Canada integrated GHS (Globally Harmonized System of Classification and Labelling of Chemicals) into WHMIS. There are many new elements that WHMIS 2015 introduced that MUST be included in WHMIS training. Our WHMIS course has been updated and covers WHMIS 2015 (GHS). Not only does this allow the course to meet compliance standards, but it gives you very important information that will assist you in keeping you and your coworkers safe and healthy. Depending on the circumstances within your specific workplace, additional training may be required. You may need to receive workplace specific WHMIS training, commonly referred to as “practical training” or “onsite training”. This type of training must be completed by your employer. Our WHMIS certificates contain a space on the reverse side where your employers can indicate the date that you’ve received any required workplace-specific training. Online Training can be completed faster and more efficiently than traditional training methods. Get your WHMIS certificate in about 1 hour. Our Online Training is more affordable and offers much greater value than traditional training methods and other online training providers. Learn at your own pace from anywhere on the planet where there’s a computer, laptop, or mobile device and a high-speed Internet connection. Our Training is current and up-to-date with the new GHS-Integrated WHMIS. Unlimited course and quiz retakes are included at no additional cost. No need to worry if you don’t happen to pass the course on your first attempt. We understand that our Online WHMIS Training may not be right for everyone. 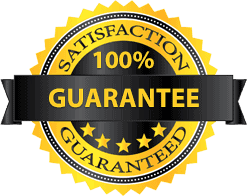 For this reason, we offer a 100% risk-free, satisfaction guarantee. Since 2010, we’ve been providing affordable and simple to use WHMIS training solutions to savvy Candian employers and workers. To date, thousands of employees who work for some of the most recognized companies in Canada have taken their WHMIS training with us. Join the thousands of satisfied learners and get your WHMIS Certificate today! My new company asked that I get my WHMIS Certificate before starting work. There were tons of options when I searched online for a provider. A coworker recommended OnlineWHMIS.ca and I'm glad she did. The entire experience was very smooth, quick, and affordable. It is convenient and I felt very detailed for an online course. Very pleased with the course, a lot of good information. I certainly would recommend to others. The course was as expected and I would recommend it to others. Designer/Drafter - WCC Crane Solutions Inc. I'm glad I got to do this at my own pace. It wasn't too informational to the point where it is annoying. Also, it wasn't what I expected it to be, it was really interesting and fun. I would recommend to others. Really convenient, lots of good interactions throughout. The training was better than expected, very straightforward and educational. The WHMIS training was very interactive and kept me engaged. 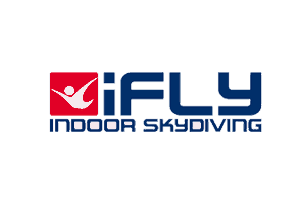 Customer service was great and very knowledgeable. Was better than I expected. More interactive and it made it easier to remember for the quizzes. I would recommend. 3rd time getting WHMIS and this was the best option I have used so far ? The WHMIS training was better than I expected. I thought it would be complicated but it was very straight and easy to understand. I'd highly recommend it to others! After successfully completing the WHMIS course, you’ll be awarded proof of training instantly. 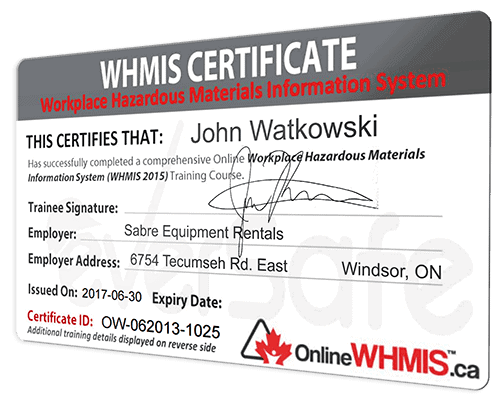 This includes an official, downloadable WHMIS training certificate card that’s widely accepted as well as a digital badge. Each certificate contains a unique certification ID that can be used to verify your certificate’s authenticity. Click on the Buy Now button and complete a simple registration form. Select your method of payment and submit your payment details. Start your course instantly and complete it at your own pace. Print your certificate. That’s it! Is my computer good enough to take the training? While our courses do contain rich media and require a fast internet connection, system requirements aren’t too demanding. You can view the System Requirements Support Article to be sure. Will you send my WHMIS certificate in the mail? We do not send certificates in the mail. After successfully completing the course, you’ll be given instant access to your certificate in PDF format. You’ll be able to instantly view, download, and print your WHMIS Certificate as required. Do I have to complete an exam? Our programs do not have a single long exam that’s required to be taken at the end of the course. Instead, there are shorter knowledge assessments (quizzes) positioned at the end of each module. These quizzes are required to be completed in order to progress through the course. Breaking up the assessments in this way is an improved approach over a single exam and improves the learner experience. Purchasing the program is completed through our secure checkout process. You have the ability to pay using all major credit cards. Is the WHMIS course available in French? What if I fail the quiz? The course content is structured and delivered so well that it’s unlikely that you’ll fail any of the module quizzes. However, if for some reason you do, there’s no need to worry. You’ll have the ability to retake the quiz until you achieve a passing grade. We highly recommend reviewing the module content again prior to starting a new quiz attempt. Can I take the training on my tablet or smartphone? Yes! Our courses are mobile optimized, meaning you can take them on most mobile devices including iPhones, iPads, and Android devices. Is there a time limit to complete the course? Our programs are designed to provide a lot of flexibility. This means you can break up the course and complete it at your own pace, or complete it all at once. You’ll have the ability to complete the course within 365 days of purchase. The average time to complete the WHMIS training is about 60 minutes. This can vary significantly due to several factors. How long before I can start the training? You can start your Online WHMIS Training course immediately after signing up and making the purchase through our secure checkout form. The whole process literally takes only a few minutes. Are you a legit WHMIS training provider? Yes! We are definitely a legit WHMIS Training provider. Our training and online training platform are powered by Eversafe Media Inc. Eversafe is a trusted online training company that’s been providing WHMIS training to thousands of Canadian workers since 2010.